NPC competitor Josh Halladay is on a quest for his pro card in 2014. 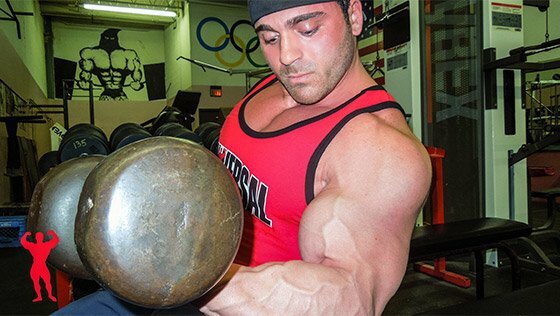 Here's the off-season arms workout that he'll use to add serious muscle to his arms! Occupation: NPC bodybuilding competitor, Universal-sponsored athlete, owner of the worCk.com. A lot of dudes want big arms. As an NPC bodybuilding competitor shooting for a spot in the IFBB, I don&apos;t really have a choice—massive arms are a must to place well and earn my pro card. To build the right amount of size and shape, I train my arms a little differently than I train the rest of my body. For other body parts, I cycle heavy weeks with high-rep weeks. For my arms, however, I train almost exclusively with high reps, forced reps, supersets, and volume. I feel like the extra blood pushed into my arms through this kind of training has really helped them grow—more so than if I were to focus on low-rep, high-weight workouts. This is a typical off-season workout for me. I don&apos;t pay a massive amount of attention to the number of reps I&apos;m doing. I&apos;m more worried about doing good reps and doing them to failure. Each week, I rotate which muscle group I hit first. This workout, I hit biceps first. You will see throughout the video that I concentrate much more on the movements and rep ranges than I do on the actual weight. You&apos;ll also notice that I use partial reps when I hit failure. In my mind, lifting to failure is one of the biggest triggers of muscle growth. Many people don&apos;t understand the purpose of half reps and call them "fake reps."
Call it what you want, but if I am physically unable to lift with a full range of motion, it&apos;s because I have completely exhausted the muscle that I am working on, not because I&apos;m slacking. In fact, I&apos;m trying to push beyond failure and elicit maximum growth. "In my mind, lifting to failure is one of the biggest triggers of muscle growth." On your next arm day, I challenge you to finish every set with a dropset to complete and utter failure—until you physically cannot complete even an eighth of the motion. I promise you won&apos;t regret it. People tend to do repetitive arm workouts, so I make a point of constantly changing exercises, sets, and reps to continually push my body to its maximum potential. That being said, there are some basic exercises that you&apos;ll always see in my arms workouts. I think barbell or dumbbell curls should always be done for biceps and some type of close-grip bench or a skull-crusher movement should always be performed for triceps. There&apos;s just no getting around the fact that these are some of the best, old-school arm movements for pure size and thickness. "People tend to do very repetitive arm workouts, so I make a point of constantly changing exercises, sets, and reps to continually push my body to its maximum potential." Another thing you&apos;ll notice about my training is that it is relatively fast-paced. Over the last year, I&apos;ve shortened the rest time I take between sets. The warmer I keep my muscles, and the more I keep moving, the better I perform during my workouts. Although the shorter rest periods mean I can&apos;t go quite as heavy, the upside is that I can completely exhaust the muscles. I&apos;m a bodybuilder, not a powerlifter. Taking less time between sets also seems to help my joints. I played football for 14 years, so I have to deal with my fair share of joint problems. Keeping up a fast pace helps those joints move more fluidly. I hope that some of these tips and pointers can help you in your quest for big pipes. Go get &apos;em and let me know after you try the workout! Yes, it&apos;s possible to train hard and still have space for recovery. Spread your lower-body work across four biweekly sessions and get ready to shop for new pants! Strong arms aren&apos;t built with fancy techniques. They&apos;re built with hard work and intense training. Try this video workout and see for yourself!